Security service careers can provide good income and exciting assignments in a recession proof industry. Do you have what it takes to become a security professional? We seek motivated people with at least an Associate Degree, or that have earned a Certificate in a criminal justice related area. Persons with industry experience, or with a military background, are very desirable. All potential employees must pass a drug screen and background check prior to being hired. We perform random drug testing of all employees. We invite any qualified and interested people to complete and submit our online employment application. Note that to be an armed security guard in Georgia there are special requirements. 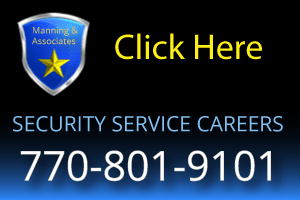 Please see the links on this page for companies that offer training to become an armed security guard in Georgia. You do not need the referenced training to be an unarmed security guard. We strive to staff our company with self-motivated individuals who conduct themselves with high ethical standards and a professional demeanor. Our company empowers our personnel through increasing their knowledge of the security industry, cross training in various security skills, and providing advancement opportunities for top performers. Our goal is to hire, train, and develop security professionals that provide exceptionally high quality services for our clients. Once accepted, our personnel receive at least 24 hours of classroom training which is conducted by our Certified Peace Officer Standards and Training (POST) Officer. All security personnel are required to complete this basic training with a passing score of at least 90%. Our clients expect the best security guards, and we strive to meet their expectations. These links are to sites offering security guard training. This is provided for only informational purposes. While we believe these to be legitimate sources, providing links here does not infer an endorsement by our company of these businesses. You should carefully qualify any program before enrolling for classes or paying fees.